“A bloody fairy-tale”, by the poetess Desanka Maksimovic gained a new interpretation these days, in the Balkans, in the Macedonian Parliament. This time, the assailants were not the Germans. And the killed would reborn in different times, but guided by same ideals. People were sitting on the Parliament benches, and editorial rooms, just 55 minutes before that tragic hour, asking themselves if peace, justice, democracy and freedom would ever return to the country. A few days later – after several sleepless nights, as every time I closed my eyes, images of wounded heads and shirts bathed in blood appeared before me – I read that many of the Parliament assailants were convicted murderers. One of them had even been convicted for murdering a 4-year-old child. To us, the people who directly confronted them, they were clearly assaulters. Monstrous eyes, followed by even more visceral screams, only confirmed their drive for crime, while destroying everything they could lay their hands on. The scenes in the Macedonian Parliament literally depicted the picture of a divided country. Parallel worlds. 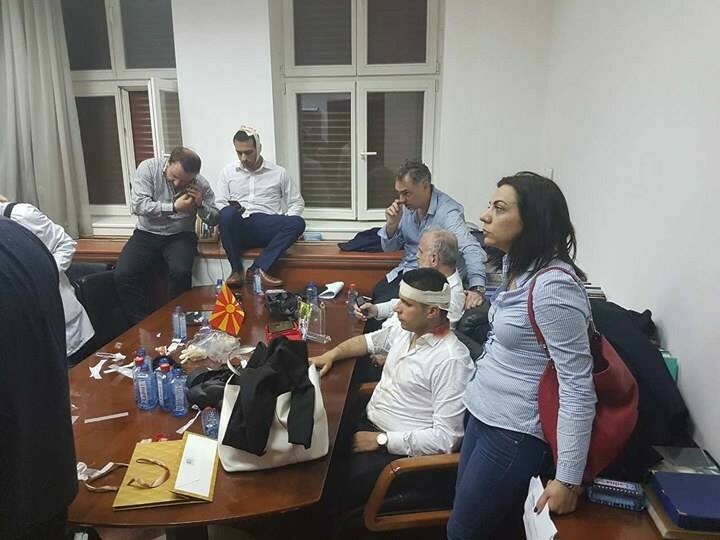 While in one hall, many were fighting for their lives, assaulted by “monsters”, in the other hall, those same monsters celebrated and kissed the hands of the ministers and representatives of VMRO-DPMNE. But, how did the Macedonian “Bloody Fairy-tale” begin, luckily without a tragic end? During the Q&A section of Zaev and Xhaferi press-conference, the rioters entered the Parliament. Everyone feared what was about to happen, except Zaev, the first to stand in front of the hall door. I was glued to the wall, the phone plugged in a nearby power outlet, while trying to broadcast everything on my Facebook profile, hoping that the police will prevent them from entering the Parliament. It was a false hope. The attackers entered the Parliament. The first target was Zaev, and then the rest of us, who were trapped inside. The MP Bocvarski tried to protect me, but I got separated from him, in the chaos. I kept on posting to Facebook, while moving down the hall, to avoid desks, iron bars and boards that were flying everywhere. I reached the Parliament’s restaurant, where few colleges journalists were hiding in the dark. I remembered my family and how worried they must be. I had to call them and calm them down. I lied to them and said, “I am okay and in a safe spot, but my battery is running low, I will call again.” I repeated the very same words during the next hours, while our lives were hanging on a thread, voices around us were shouting “KILL HIM”, gun shots went off, while we chocked from smoked bombs. In the back of my mind, I was asking myself: will we even survive this? The next call I made was a “live” broadcast from 24VESTI program. “Zaev is covered in blood,” was the first news I passed on, as the assailants, some of them masked, entered the halls and pushed everyone in a corner. Monsters that did not only ask for blood, but for lives. After I called home and work, I again entered the hall of horror, hoping to find my colleges – the cameraman Vlatko and Dushica. But I heard a gunshot! I did not know, nor I could see who fired the gun. Were there any injured? Someone from outside said: don’t open the door! Stay there! I called work again, waiting for a new live feed – to inform them of the shootings. At that moment, a man entered, with a red and yellow band around his arm. He started yelling and sat on one of the chairs. My question – “what is going on” – raised the tension in the room. He asked which TV station I came from, and I explained that this was not important at the moment, but he answered: “I know what TV station you work for, I just wanted to see if you would say it”. Then, he started talking about the Bible, but I was not following him, as the phone was ringing and my crew expected a live report from the scene. I wrote a text to one of my colleagues – “can’t speak now, one of the demonstrators is near me”. I got up to get some water and I offered him some as well. I sat next to him, saying, “You are a good man”. Meanwhile, we started talking about other subjects, while hearing gunshots nearby. Dushica (also a TV reporter) entered the room, and she was hurt and shaken. She witnessed the assailants literally trying to kill Zijadin Sela. During all this time, the parents of the red-yellow band man were trying to reach him on his phone, which was ringing constantly. His family was also shaken. Same as my own, same as Dushica’s parents, and everyone else. He also lied that he was safe, but he could not convince them. He gave me the phone, so I could talk to his mother. I introduced myself and I tried to tell her that her son is safe with us, that he is not involved in anything at the moment. But, she, as any normal mother would, was worried that her son was going to be convicted, that there was no one to save him, and she begged him to leave the Parliament. I explained that at the time there was no chance for us to leave the building, and her next question was “where is his brother”? Nevertheless, the journalist spirit inside us was stronger than the fear enveloping us. Dusica and I went to the other room, where Zaev and the rest were still inhumanly beaten in the corner. Vlatko Gjorcev (VMRO MP) tried to defend them. We tried to live broadcast with our phones, but when the assailants saw we were recording them, they took my phone and threw it away. They started to drag us, push us and assault us verbally. We were surrounded by 15 men – against 2 women. Unsavory characters that oozed with aggression and violence, while they screamed at us. I desperately tried to find someone to talk to, before it was too late. One of them looked more reasonable than others. I managed to convince him to get me out of the crowd, so I could show him I had no recordings. He agreed. He took me to a room, which filled me with great fear, as we were alone. Dushica tried to enter with me, but she was hit and thrown out. While he checked my phone, 2 more men entered. At that time, Dushica was asking for help from the Parliament security people, which we met almost every day while we did our jobs there. But, their answer was that they did not have orders. Imagine that, they did not have orders to save lives!? After the three protesters saw that I have no recordings on my phone, they started avoiding responsibility, by saying that situation went out of control, and that they had no intention of hurting me. I started crying. In front of people I did not even know. They tried to calm me down and let Dushica enter the room. They brought me some water and they checked my pulse. A new character entered the room with a balaclava over his head and I told him I had no recordings. One of them said that there was a pregnant woman in the Parliament and she needed to be saved. But they did not know how to do it. I was scared for my life, but I offered to help to save this woman. I showed them were we had been hidden earlier, and told them that if we managed to get past the red-yellow band, they would be able to take the woman out of there, and I also asked them not to leave us trapped inside. Luckily, the first protester I had met was still there. They left, and we stayed there. After this, I called home again to tell them I was alive and safe, regardless of what I had been living. After a while, Vlatko Gjorchev appeared and the Special Forces outside were clearing out the protesters and were evacuating the MP’s. Again there was a call for a live feed. The police were here, the MP’s were being evacuated, the protesters were not in the room, but they were all over the building. We had little info about where they were, and the police allowed us to take some photos. We thought that we were saved, but when they led us to the room where the MP’s were, there was another shock. Medical personnel tried to save the life of a man laying down, but I could not see his face. They were looking for a way to take him out, because he could not be physically moved. Finally they managed to get him to the ambulance. At one moment, Gjorcev entered the room again and almost frantically begged Talat Xhaferi to stop –saying “yours” -, as Albanians organized from Tetovo, Gostivar, and some other people started gathering at the Old Bazaar. Probably he asked Zaev the same, a few minutes later. A thought crossed my mind – would we get out of here alive, or we would all end here in this room? However, I went on asking people if they are okay, as they were bleeding. I gave them water, medicine, everything that could help. They had bandages over their heads, but blood was pouring. Some of them were in grave conditions. Again, Gjorcev asked for three of the badly injured to be evacuated, because there was a chance for them. Someone sayd that Zaev, Nikolovski and Silegov needed to go. But, Zaev said he was not getting up. No one else got up. Not until everyone could be evacuated. After a while, such chance was available. First the women, and then the men were evacuated. As the evacuation began, we were moving through the Parliament corridors with the security officers, with great fear, not knowing if everything would be successful. My colleagues Dusica, Gabriela and I entered a military vehicle, with the female MP’s from VMRO, while our colleagues were outside the Parliament, taking photos of the moment. Inside the vehicle, everyone was calling home, to say they were safe, and Dushica called work with live feed to report the information. She lent me her second phone to call my own home and tell everyone I was safe. While driving off together with Daniela Rangelova, Ane Leskoska and Vladana Avirovic, it was obvious that they were also scared. Luckily, they were also not injured, except Avirovic, who was stomped by the protesters. But she did not explain what happened when they celebrated the protesters arrival, and how was she hurt. I honestly hope that they too, after what they have been through, will think about their actions and about the policies they will support in the future.